Here we go with Part 2 of what I know so far about doing research in Germany. 7. 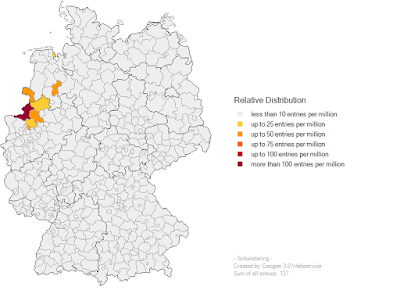 German Genealogical Societies: Societies, which you must pay to join, can have many resources available only to their members. 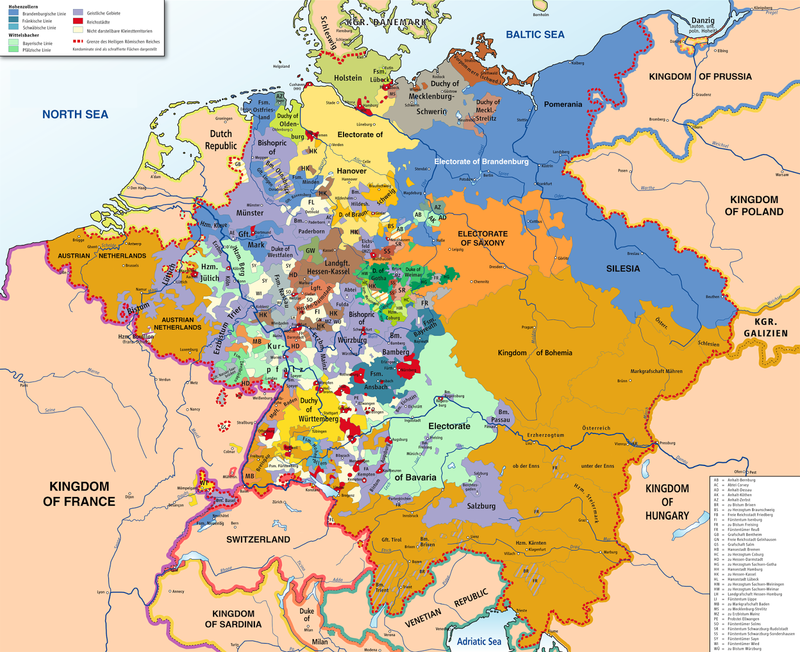 I belong to several: The Sacramento German Genealogy Society, the German Genealogy Group, and the Niedersächsischer Landesverein für Familienkunde, the Lower Saxony State Society for Family History. If you're in California or Nevada and can get to Sacramento, every spring the SGGS has a one-day workshop for which they bring in excellent speakers. It's a whole day focused on German genealogy, and I've learned a lot in the two times I've gone. The GGG has links to interesting resources, including New York bride and groom indexes. The NLF has a lively email list where you can ask questions, and their members will help you with your research. Die Maus is a Bremen-based society that I haven't joined but should. It has a great deal of information of many kinds, including Bremen passenger lists. Most societies will also maintain a surname list; you should keep an up-to-date surname list that you can send as part of your membership application. You can make good connections in this way. 8. E-mail Lists: If you don't speak German, you may have a little trouble with this resource, but here you will find a long list of email groups that mostly pertain to different areas in Germany: Brandenburg-L, Franken-L, and so on. Look at the area in brackets at the end of each listing; if you see the word "geschlossene Vereinsliste," that means a closed list (for example, you have to be an NLF member to join their list); if you see "deutschsprachige, offene Liste," that means an open, German-speaking list; if you see "bilingual, offene/open List(e)," it's an open, bilingual list. If you're lucky, you'll find a list from your area and might get some help -- I once had a nice elderly gentleman go to an archive in Bremerhaven and look up some information for me. 9. Emigration/Immigration Databases: I've personally found the whole emigration/ immigration area to be very frustrating; at this point, I'm not sure that I have the correct information for all of the immigrant ancestors I've researched. Here's where we get into an important issue -- if I've learned anything over the past few years, it's not to get stuck on dates or ages. Many things might affect a date or age -- who's giving the report, do they have a reason to nudge the age up or down by a few years, are they literate enough to know exactly when they were born and how to figure their current age? 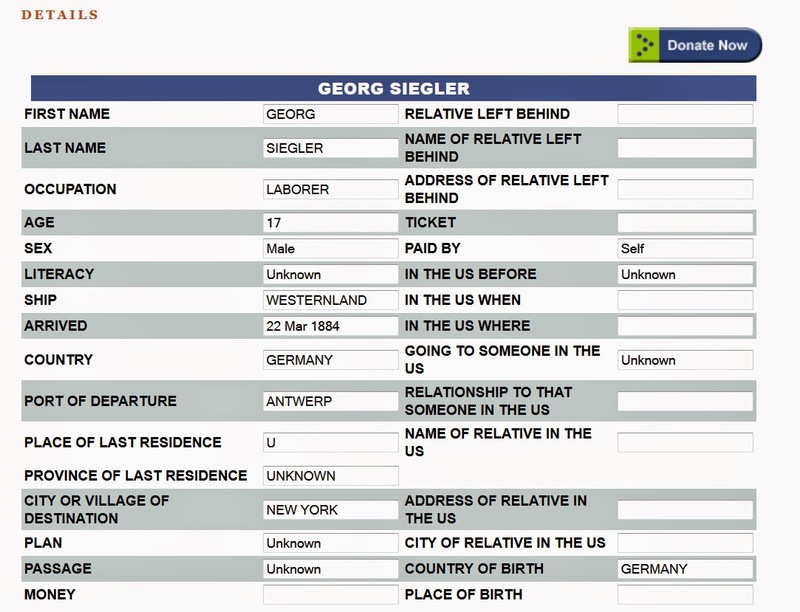 This is the Castle Garden record for my great-grandfather, George Siegler. While it seems it could be right, the age is wrong -- I know his exact date of birth from church records in Lohr am Main, and that would make him 15 when he emigrated, not 17. I accept that this is his record, though, in the absence of anything more definitive. You can find emigration/immigration databases galore; good places to start are Cyndy's List, Ellis Island and Castle Garden on the American side; try Ancestry.com, Deutsche Auswanderer-Datenbank, and the Bremer Passagierlisten at Die Maus on the German side. Not too helpful in narrowing things down, right? Still, I have a map saved for each of my ancestors' main surnames. Well, I thought I could do this in two parts, but clearly that's not going to work. On to Part 3. I'm not able to find that web site that shows name distribution. I'm puzzled because I just clicked on the Geogen link above and was taken to the website. Try this address: http://geogen.stoepel.net/. I hope it works for you. I'm not all that interested in Stoepel. I'd rather look for my own family. Stoepel is the name of the man who programmed the website -- he uses his own name as an example. Go down below the lines of orange type to where it says "name>" in blue -- that's where you put in your own name and push "enter" to search on it.